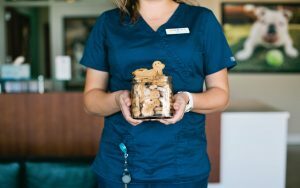 Our compassionate, highly-skilled and experienced Veterinarians (and adorable mascot) are the core of the Animal Emergency & Specialty team. We do not hire new graduates, interns, or residents. 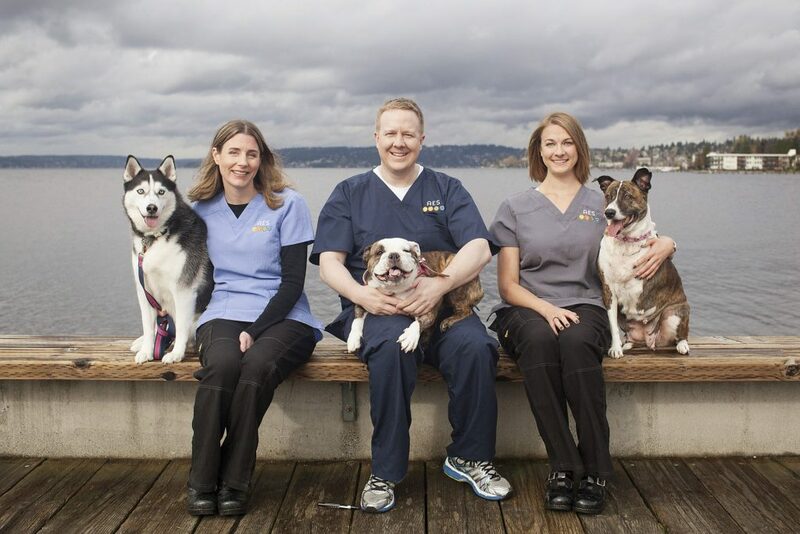 You can rest assured that your pet is in experienced hands at our hospital. 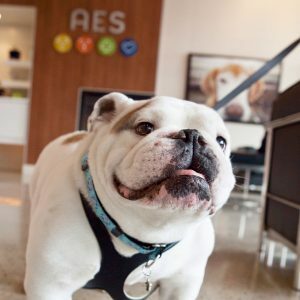 When we met Wilson through Pacific Northwest Bulldog Rescue, it was love at first sight! A natural (some may say “ham”) in front of the camera, Wilson soon assumed the duty of beloved Hospital Mascot at community events. Even after being diagnosed with an inoperable cancerous tumor in January 2013, Wilson continued to live life to the fullest, playing fetch at least twice a day. He was also passionate about swimming at K9 Aquatics spa. Wilson peacefully crossed the Rainbow Bridge in July 2015. But his memory lives on in our hearts, and his giant portrait (with favorite tennis ball) still welcomes everyone who walks into our lobby. 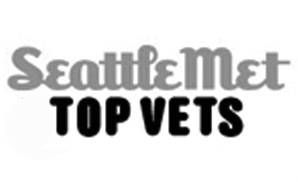 Dr. Mark O’Hanlon earned his DVM from Washington State University in 2001. He also has a BA with Distinction in Anthropology from the UW. He is especially interested in the treatment of Gastric Dilatation and Volvulus/Torsion (“GDV” or “bloat”) and Diabetic Ketoacidosis. 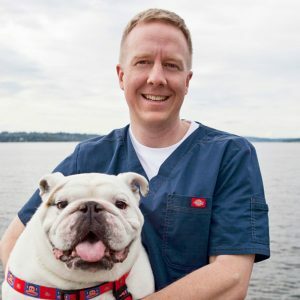 In his free time, Dr. O’Hanlon enjoys practicing yoga, rooting for the Huskies, gardening, and spending time with his three English Bulldogs. The most unusual animal I’ve treated is . . . a Gila monster while working at a veterinary hospital in Osaka, Japan. The client did not realize they are venomous! What I enjoy most about being a vet is . . . emergency and critical care medicine because it is truly a box of chocolates; you never know what kind of case will arrive next. Sometimes the case is a dog who ate a box of chocolates! The pet-related person I most admire is . . . Dr. Leo Bustad for his pioneering work on the concept of the human-animal bond. 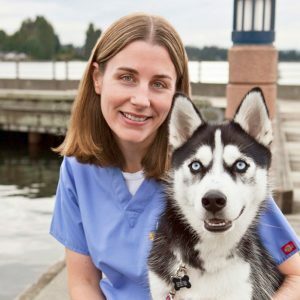 Dr. Kelci McKeirnan grew up in Kirkland and received her DVM from Washington State University. 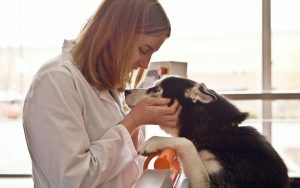 She then traveled to Oklahoma State University, where she completed her small animal surgery residency and earned a master’s degree in Veterinary Biomedical Sciences. She became a Diplomate of the American College of Veterinary Surgeons in 2013. 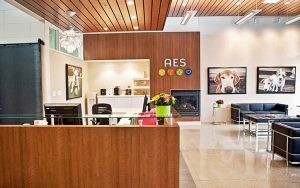 Before joining AES, Dr. McKeirnan was a faculty member at Oklahoma State University’s Center for Veterinary Health Sciences, where she regularly performed soft-tissue, orthopedic and neurologic surgeries as well as trained and mentored residents and veterinary students. The most unusual animal I’ve treated is . . . a flamingo. We performed corrective osteotomies for two baby flamingos born with crooked legs while I worked at Oklahoma State University. The latest addition to my family is . . . my Husky, Ti. She was brought in injured to the triage center I was helping at in Moore, Oklahoma, after the EF5 tornado in 2013. After attempts to locate her family failed, I adopted her. She is still afraid of the wind. My favorite food is . . . fried pickles. Something I learned about while living in Oklahoma: everything tastes better fried! 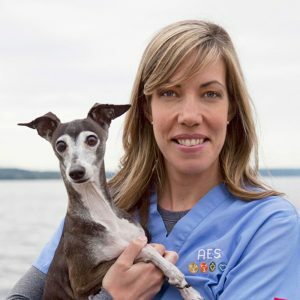 Dr. Christin Reminga earned her DVM from the University of Wisconsin and completed a small animal rotating internship at the Animal Medical Center in Manhattan. She then joined the Matthew J. Ryan Small Animal Veterinary Hospital at the University of Pennsylvania as an Emergency & Critical Care Resident. She became a Diplomate of the American College of Veterinary Emergency & Critical Care in 2016. In her free time, Dr. Reminga enjoys the outdoors and loves to spend time horseback riding, camping, hiking, sailing, and scuba diving. She also plays the violin and is an award-winning figure skater! The most unusual animal I’ve treated is . . . a 20-year-old African Elephant named Debbie, who needed surgery after choking on plant material. I was responsible for her anesthesia, which required two machines to deliver breaths simultaneously since Debbie’s lungs were twice as large as those of an adult horse or cow. It was an unforgettable experience. Debbie is still doing great at the Philadelphia Zoo! Something on my bucket list is . . . volunteering as a veterinarian for the Alaskan Iditarod! I have dreamed of this since I was a little girl. It would be an honor to be part of such a wonderful race and to work alongside these incredible canine athletes and their dedicated handlers. Dr. Taylor Tungseth is a Minnesota native who graduated from the Kansas State University College of Veterinary Medicine in 2014. He and his wife, an equine veterinarian, recently relocated from the Tampa area, where he was a Senior Emergency Clinician at a corporate specialty hospital. Welcome to Washington, Tungseths! We hope you love it here! Photo coming soon. 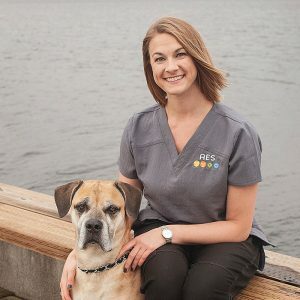 Dr. Tucker earned her DVM from Michigan State University. Before joining AES, she worked at a 24-hour emergency hospital in Virginia. Dr. Tucker and her husband, who is also an ER vet, enjoy traveling, hiking, and cross-country skiing. My favorite animal is . . . Isabell, my sweet Italian Greyhound. She has a heart of gold and loves to take part in whatever I am doing, even if it means floating in a kayak or flying in an airplane. What I would like to learn next is . . . sailing. My husband and I make frequent trips to the San Juan Islands and would love to explore more by sailboat. The best thing about working at AES is . . . the personalized service we provide in a comfortable atmosphere. Dr. Minamoto joined us from Texas A&M University’s world-renowned Gastrointestinal Laboratory, where he published numerous peer-reviewed articles as a post-doctoral fellow. He also earned his PhD and completed a rigorous internship in Small Animal Emergency and Critical Care medicine at Texas A&M’s College of Veterinary Medicine. Before that, he worked as an Emergency Veterinarian in Osaka, Japan. Dr. Minamoto enjoys the outdoors and loves spending time with his wife (a fellow veterinarian and PhD candidate) and daughter (a future veterinarian for sure). Photo coming soon.